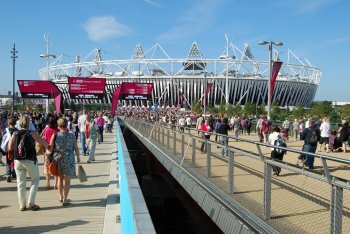 COWI (previously Flint & Neill Limited) was appointed by principal contractor Balfour Beatty to provide erection engineering services for the deconstruction of the original roof of the London Olympic Stadium and subsequent construction of a new long-span replacement roof for what is now called the London Stadium. This work was required as part of transformation works carried out on behalf of the London Legacy Development Corporation. LUSAS was subcontracted by COWI to perform independent checking of the various deconstruction and construction stages involved, and confirmed the adequacy of the structural members which formed the permanent works and global stability of the structure under applied loads. Subsequent conversion of the stadium into a mixed-use venue required a new roof to be constructed. COWI used its own in-house package NODLE to carry out a deconstruction analysis of the original roof involving dismantling of the lighting towers, removal of the membrane, and lowering of the cable net, and roof deconstruction was completed in February 2014. 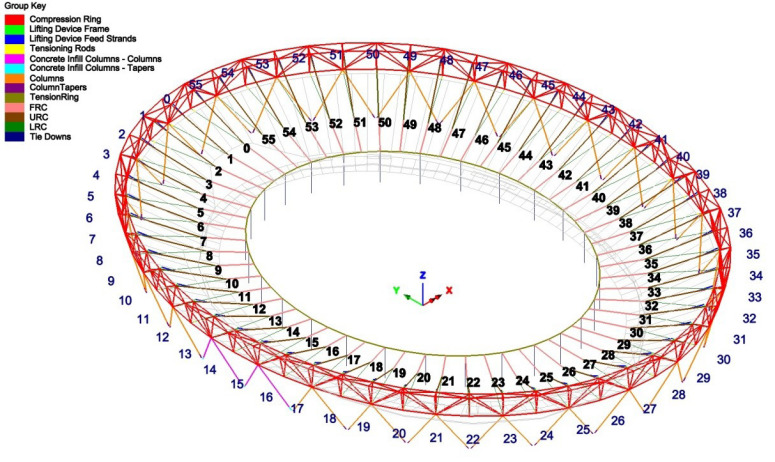 Whilst LUSAS also carried its own deconstruction analysis of the original roof, this case study is limited to the erection engineering analysis performed for the replacement structure. 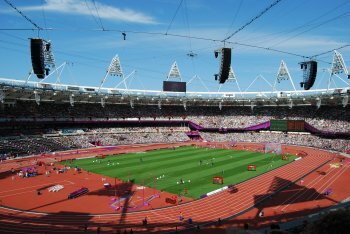 London Olympic stadium as originally constructed. The new roof consists of a primary cable net structure supporting articulated steel trusses which create the upper roof profile and in turn support the roof coverings. The existing compression truss connections and raked V-columns required strengthening to bear the increased loading from the new roof structure which, at approximately 48,000 square metres, and with a maximum cantilevered length of 84m, is twice the area and three times the span of the original. New and original roof configuration. 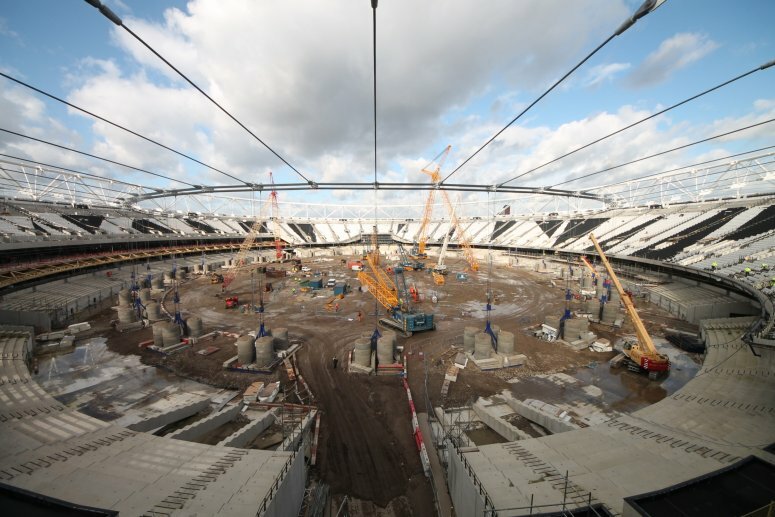 Key components of the new London Stadium roof. 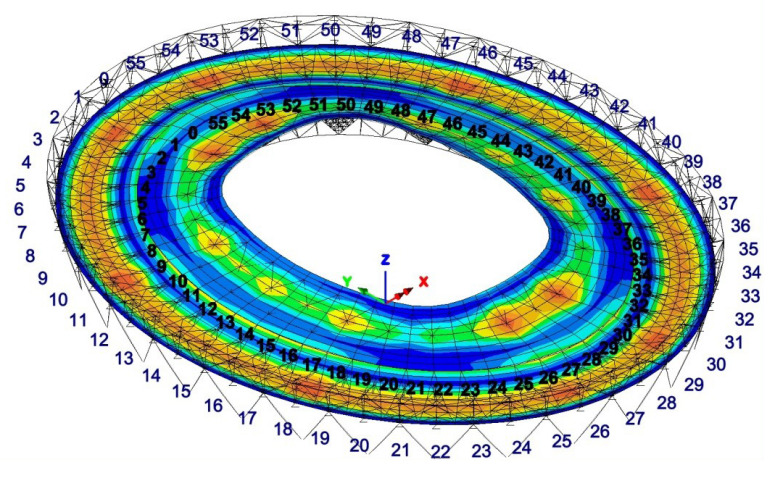 Ensuring that the starting LUSAS finite element model (used in a reverse analysis) satisfied the reference stressed state reflecting the permanent condition of the completed stadium roof. Analysing the staged replacement of the V-columns and providing an envelope of member forces on connections for use and verification of local connections by others. Analysing the roof structure at various stages in order to verify that all structural members designed for permanent condition were adequate for the proposed construction methodology and that structural stability was maintained throughout. Providing internal forces, enveloped erection force effects and utilisation factors for critical members in the roof members, cables, compression truss and column structure for various stages of the construction process; and displacements at key locations for various stages. 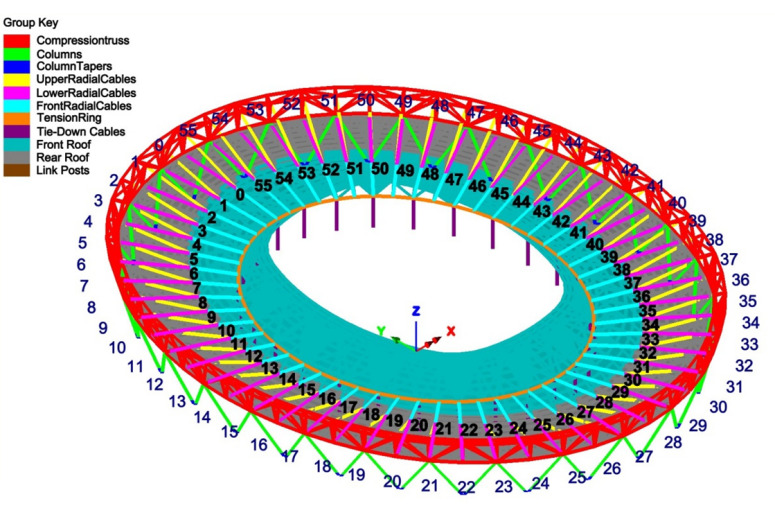 The compression truss and columns of the stadium were modelled and analysed using appropriate large displacement nonlinear methods, using thick nonlinear beam elements in which shear deformations were included. 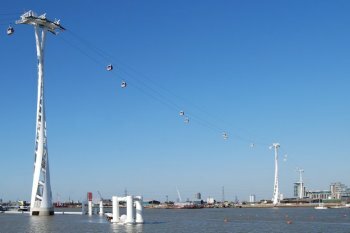 Cables were modelled using multiple elements to distribute self-weight loading along their lengths, and to include the geometrically nonlinear effects of the cables sagging. Cable element end releases permitted free rotation at the cable connections, and a low bending stiffness along with using nonlinear joints at their end allowed the cables to behave as tension-only members. Beam end releases were used to model the individual connection requirements for each member. For modelling and analysis of all construction phases extensive use was made of LUSAS Visual Basic scripting facilities to automate procedures such as loading assignment, creation of load combinations, and the carrying out of design checks. This required the strengthening and replacement of the original raked V-columns. 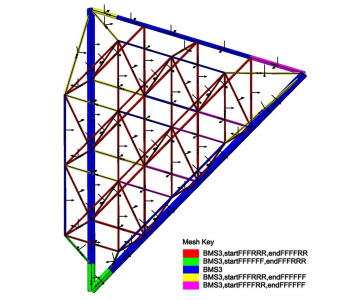 Replacement of the original raked V-columns was simulated using a geometrically nonlinear static analysis to take into account the effects of the changes in position and angle between column and truss members. To model each column replacement, first, the support at the bottom of the adjacent column (which was not being removed) was changed to be pinned and the framing-in column removed. Then, a total imposed displacement load was applied to the upper node of the removed column to return the deformed mesh to its original position (modelling the jacking-up process). A new column was then activated with pinned supports. Removal of jacking simply required removal of the imposed displacement, before permanent loading only was re-applied to reinstate the original loading conditions. 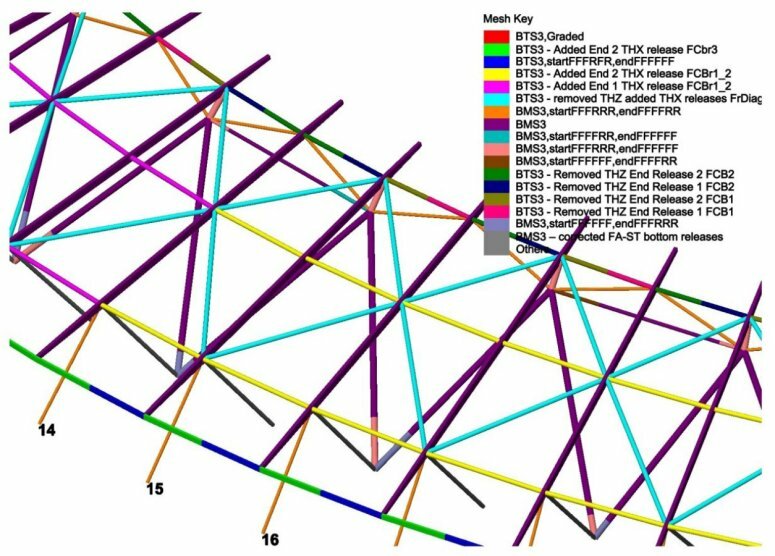 Member resistances/utilisations were calculated using BS5950-1:2000 for all members in the compression truss using the appropriate section properties. To do so, two global models were developed; one having diagonal members of the compression ring pinned about both axes of rotation such that end moments would be zero, and the other with diagonal and radial members pinned about one axis and rigidly fixed about the second. For summarising truss connection force envelopes, the fully pinned model was used, but for all other results the model with one fixed end condition was used. Checks carried out for Phase 1 included those appropriate for shear, moments, axial tension/compression and combined effects as appropriate. 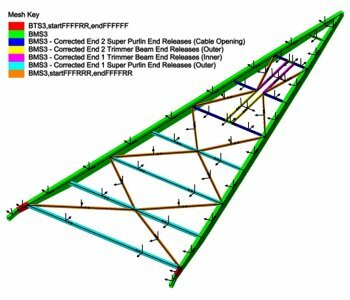 Results plots and spreadsheets of utilisation factors for all truss members and loadcase combinations based on design code were obtained and confirmed the adequacy of the permanent works and the stability of the structure during column replacement. The tension ring was lifted into place by using strand jacks installed on the inner top chord of the compression truss. This was followed by installing and stressing the lower radial cables using hydraulic jacks. Temporary tie-downs were installed to pull the tension ring into a predefined geometry. LUSAS model for Phase 2 analysis. 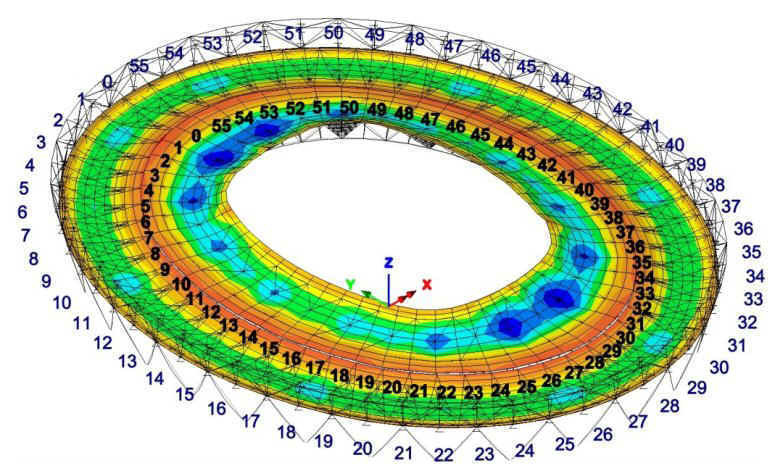 The initial lay-out positions on the ground for the lug plates and tension ring connectors were one of many items to be determined as part of the Phase 2 analyses. 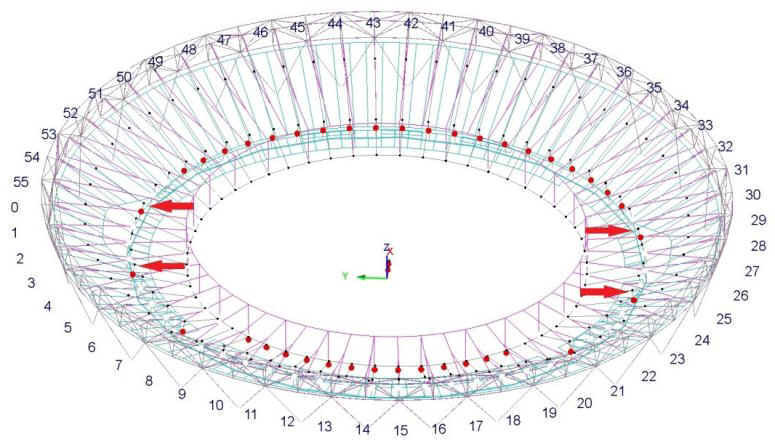 From inspection of the roof geometry and member connections to be used when modelling the construction of the rear roof (Phase 3A), it was seen that a reverse construction (deconstruction) modelling approach could be taken, and this was critical to being able to start the analyses from the supplied reference condition for the final form of the structure. As a result, the lifting and stressing analysis was therefore carried out in a reverse order starting from the end of the stressing phase, and modelling the lowering of the cable net system until the cable-net lug plates and tension ring connectors had come to rest on the seating tiers and the ground. Joint elements with nonlinear smooth contact properties were used at the intermediate nodes and tension ring nodes to model contact in a direction normal to the ground and upper or lower seating tiers as appropriate. The bases of the V-columns were modelled as pinned during the stressing phases. At the end of the stressing phase the bolts at the bases of the columns were fully tightened and these were modelled as fully fixed in translation and rotation from the end of the stressing phase and during the tying down and roof steelwork erection phases. The Upper Radial Cables (URC), Lower Radial Cables (LRC), Front Radial Cables (FRC), tension ring and lifting device feed strands were modelled in LUSAS using multiple thick nonlinear beam elements with end release to allow free rotation at the cable connections. Cables were modelled with multiple elements to include the geometrically nonlinear effects of the cables sagging. Lug plates at intermediate nodes and the tension ring connectors were modelled as a single node with their self weight applied as a concentrated point loading at each appropriate location. Tie-downs were modelled using a single bar element per tie-down. Tie downs (without any anchorage) were to be allowed to lift with the tension ring, and as a result the weight of these tie downs and their connections was modelled as a concentrated load at each tie down location. For anchored tie-downs, the weight of each kentledge was applied as a concentrated load at the supported point at the tie down location in the model, to allow reactions to be checked more easily. Cable-net lift (red circles show contact locations). Animation of cable-net lift: aerial view. Animation of cable-net lift: view along y-axis. Isolated animation of cable-net lifting at grid line 0. Cable-net installation and tie-down complete. In Phase 3, roof erection started with the installation of the rear roof and on two construction fronts, with the installation of the rear roof cladding following one-eighth behind the construction fronts. 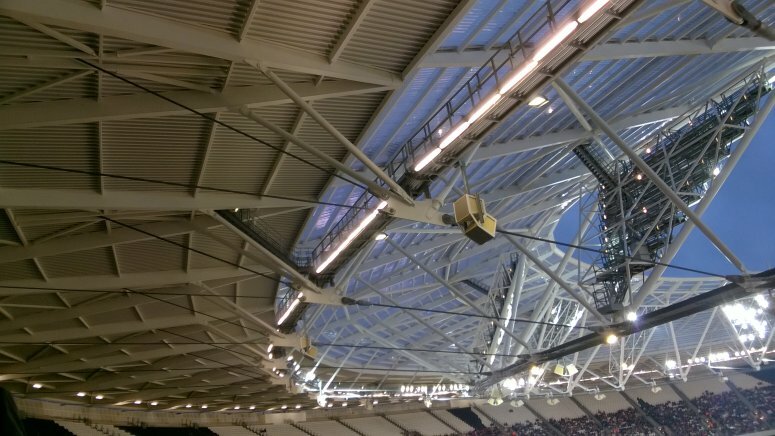 Once the main steelwork and three-quarters of the rear roof was clad the erection of the front roof started, with its associated lighting towers and cladding following a similar sequence. To aid the erection process to achieve the target roof configuration, temporary link posts were installed at the apex of the rear roof back diagonal beams where the rear and front roof were temporarily linked. The outer ends of the front radial beams were connected to these to allow the front roof to be held as further elements were installed. Using LUSAS Civil & Structural a geometrically nonlinear static forward analysis was carried out to take into account the effects of the changes in position and angle between members and to account for nonlinear effects in cables. 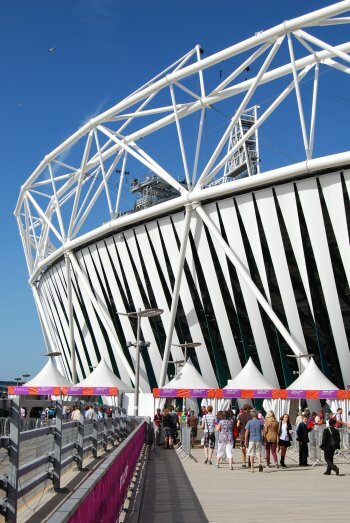 The column, truss and cable net configuration was inherited from the Phase 2 analysis, so that identical stressing and tie-down stages could be incorporated into the Phase 3 analyses, and additional steelwork and cladding of the front roof was incorporated into the analysis. When modelling in LUSAS, the link posts were considered to be very stiff to obtain the forces-moments in these members and ensure that the correct relative positions of the rear and front roofs were maintained. These link posts, along with the tie-down cables installed in Phase 2, were removed once the roof erection process was complete. 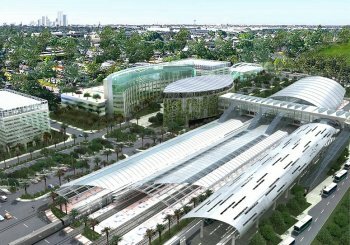 By using a forward construction analysis as opposed to a reverse one, after removing the link posts and tie downs the circumferential beams of the front roof steelwork would be in axial compression on completion, and a predicted constructed geometry would be obtained. LUSAS model for Phase 3 analyses. Modelling of front roof erection showing lighting tower steelwork. 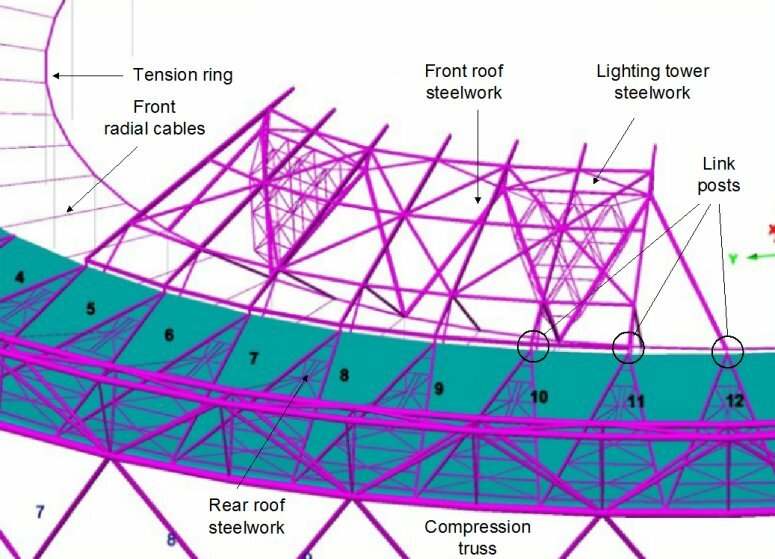 Detail of front roof framing steelwork showing beam element assignments and end releases used. Detail of rear roof framing steelwork. Lighting tower steelwork. Modelling of rear and front roof erection sequences. View of rear and front roofs showing upper, lower and front radial cables connecting to lug plates and tension ring. Vertical displacement contours for final roof position (for cladding speed case 1). Resultant displacement contours for final roof position (for cladding speed case 1). 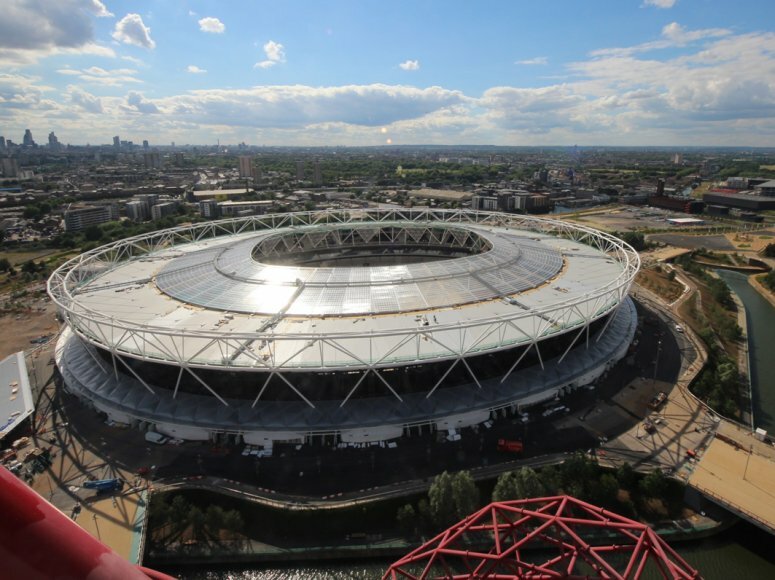 The transformation of the former London Olympic Stadium into what is now known as the London Stadium is now complete, and its replacement roof is believed to be the longest cantilevered roof in the world. 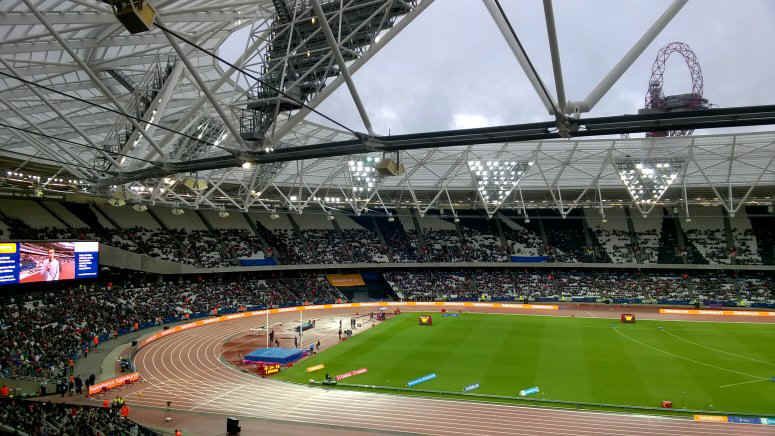 From 2016 it became the new home for West Ham United Football Club, and the National Competition Centre for athletics in the UK. 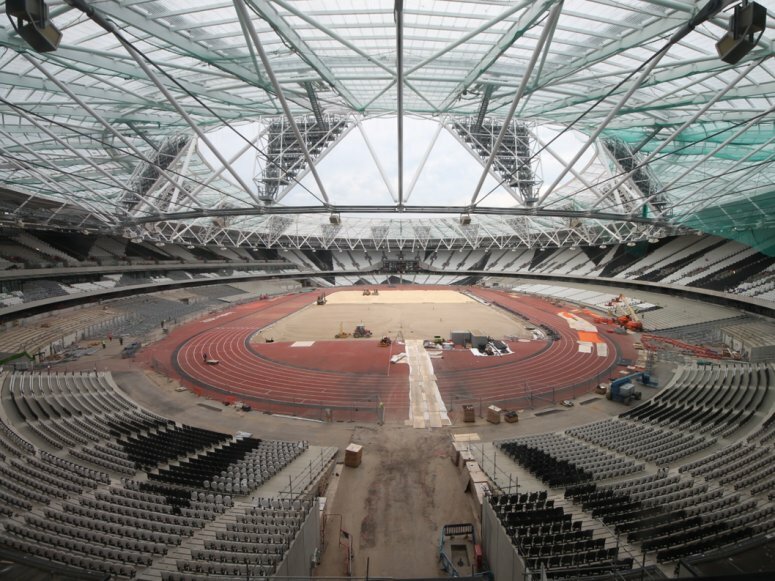 As viewed from the adjacent ArcelorMittal Orbit structure in Queen Elizabeth Olympic Park. "The use of LUSAS VB Scripting techniques to customise the software and to automate the extensive modelling and checking procedures required, allowed us to save a great deal of time and ultimately confirm the adequacy of the structural members which formed the permanent works and global stability of the structure under the applied loads."